The warmer weather is on the way. The sun is shining. The grass is getting a little greener and we can finally start to get outside in the fresh air without the teeth chattering. But with the beautiful weather comes something not so great – flies. Dirty, buzzy, annoying flies. We know they’re there. They buzz around our ears and our BBQs. We swat them away without conscious thought. But have you ever thought how dangerous the common household fly is? Whilst they may appear seemingly harmless, when the humble-yet-disgusting housefly sits on our food it’s spreading germs and transferring bacteria. Let’s take a look at a few facts about the fly and then some important tips on how to prevent the spread of their germs! 1. Flies can’t eat solids: When it sits on food a fly doesn’t eat it directly. Instead it vomits on the food to make it digestible and then eats it. 2. 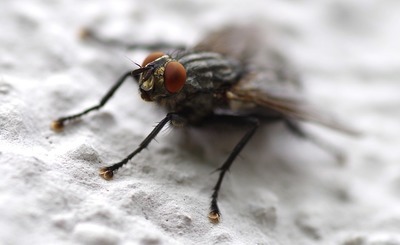 Houseflies transmit all sorts of foul stuff: House flies are known to transmit harmful and sometimes fatal diseases such as typhoid, conjunctivitis and tuberculosis. Next time you get a gunky eye, you might have a fly to blame! 3. Reproduction: Flies reproduce quicker in the warmer seasons so during the warmer months, take special care to treat any areas where you see them hanging around. 4. Flies are hairy beasts: If you’ve ever looked at a fly closely, you would have noticed that it’s covered in hair. No really, covered. Flies even have hairy legs and feet because the hair helps them smell and taste their food. In fact a fly needs to stand on food to get a good taste of it. So now that you know a little more about the fly, it is good to know that there are plenty of simple strategies you can implement to prevent flies getting the better of you. Protecting your home from germs spread by the housefly is essential given the potential danger they can have on your family and the food we eat.